Who else wants to get more than 10,000 unique visitors per day to a blog? Right now you’re looking for a way you’ll use to get more readers to your blog. You want to attract more readers to your blog. You want to increase your blog subscription rate. You want to become an authority in your niche. You want your blog to become popular. I’m revealing to you 10 sneaky ways to use Pinterest to get more traffic to your blog. Why Pinterest? You may ask. Let me convince you why you should use Pinterest by mentioning what has already been said online about this website. To begin with, social media research firm Semiocast reported in 2013 that Pinterest had more than 70 million users. 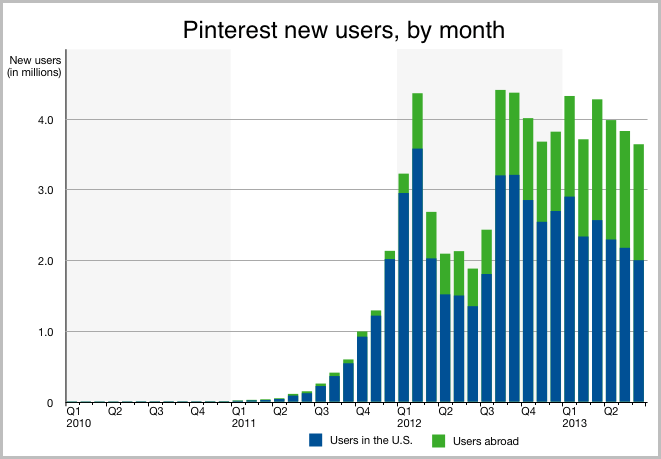 Many new international users are joining Pinterest compared to new users from US. Globally, 83% of Pinterest users are women. However, more men are now joining Pinterest. 1/3 of all Pinterest signups are men. It was reported by Pinterest that the number of male users is growing quickly compared to that of women. In 2014, it was announced by Pinterest that 75% of its traffic comes from mobile tablets and phones. Pins that mention the price receive 36% more likes compared to pins that don’t mention the price. More people are likely to see your pins than the number of your followers. When your followers repin your pins, their followers are likely to see your pins. Compared to Facebook and Twitter, Pinterest is the 3rd most popular social networking site in the US. It was revealed by Beth Hayden (who is the author of ‘Pinfluence’) that Pinterest drives more referral traffic compared to Google+, LinkedIn and YouTube combined. Do you now realize you need to use Pinterest to get traffic to your blog? Yes, Pinterest is a good source of traffic that converts into buyers. If you’re not leveraging the power of Pinterest, you’re missing out a significant amount of blog traffic. By using effective ways to promote your blog on this social network, it’s possible to get more traffic to your blog. Here is a closer look at the 10 effective ways you can use today to drive more traffic to your blog by leveraging the power of Pinterest. When it comes to doing business online, branding plays a great role. Consumers are expecting to find products that are customized and personalized. So, it’s important that you create a brand page for your blog on Pinterest. You see, before someone decides to take an interest to look at your pins or to follow you on Pinterest, he or she will first look at how you’ve branded your Pinterest page. If you don’t brand your Pinterest page, you’re likely not to attract the interest of Pinterest users. They’ll not read your bio or click your Pinterest Board. You should brand your Pinterest page to increase the chances of your bio being read and your Board being clicked by Pinterest users. This way, you are likely to build your audience on Pinterest. You build the audience that will be visiting your blog to read your blog posts. You can either create a business account or a personal account on Pinterest. 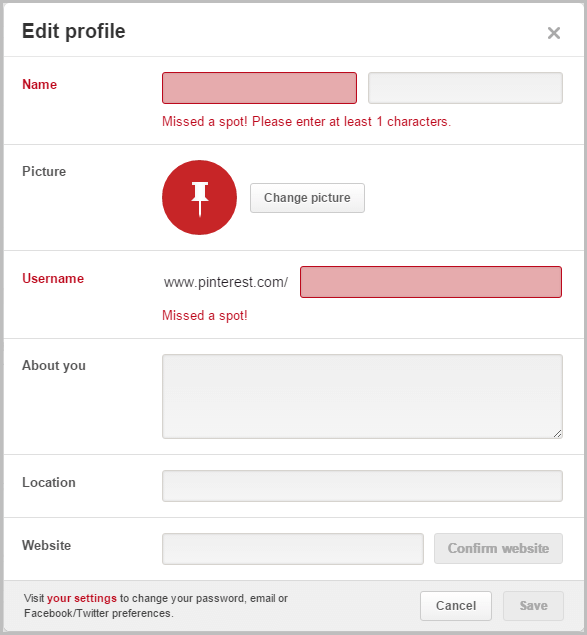 Once you have created an account for your blog on Pinterest, you should edit your profile. Below is an example on how to create a Pinterest profile for your blog. The name should be that of your blog. Upload the logo of your blog to be Pinterest profile image. The name should be short. If possible, use a keyword. Write an attractive bio that will make Pinterest users to take an interest in finding out more about your blog. The bio you write should be a brief description about what your blog does. Fill in the region where you stay or the name of your country. You should fill in the URL of your blog (address of your blog). Make sure that you verify it on Pinterest. 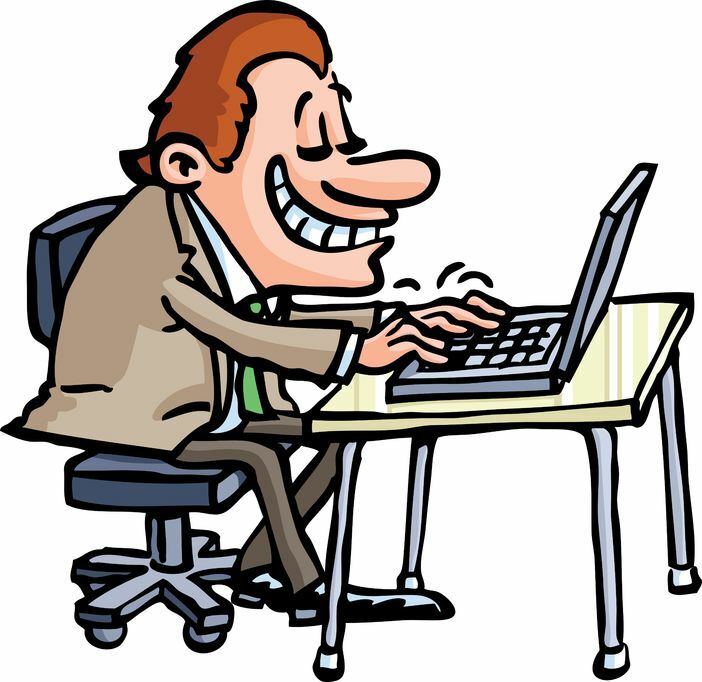 After verifying your blog, its URL will show up on your profile page. Verifying your blog on Pinterest has the ability to get more traffic to your blog as more people notice your Board and click your pins on Pinterest. When users go to your Pinterest profile page, they can click on that URL and go right to your blog. 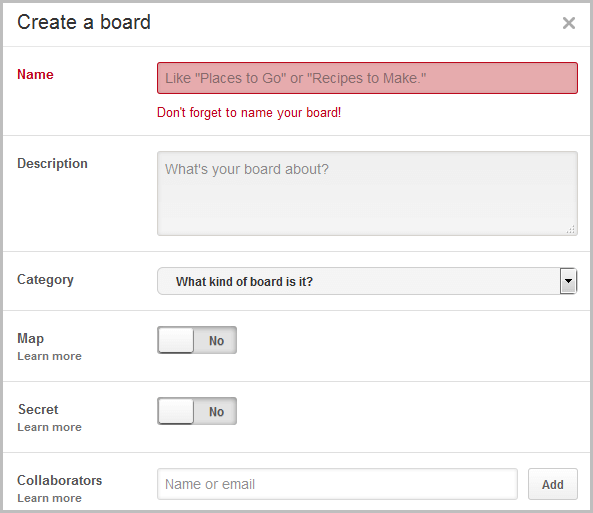 Don’t create many Boards on Pinterest. One Board is enough for your blog. Choose a good name for your Board. It should be a name that describes what your blog is all about. It should be a keyword name. By using a keyword to be the name of your Pinterest Board, you make it easy for people to find your content on Pinterest. You also optimize your blog in the search engines. If for instance your blog is fashiondesigner.net, you can use the keyword ‘fashion designs’ to be the name of your Pinterest Board. How do you ensure that you choose the right keyword for your Pinterest Board? The best way to find the right keyword to optimize your Pinterest Board in the search engines is by using a keyword tool like Google Keyword Planner. For instance, I used Google Keyword Planner to find this keyword ‘Fashion designs’ that is not too competitive to use. 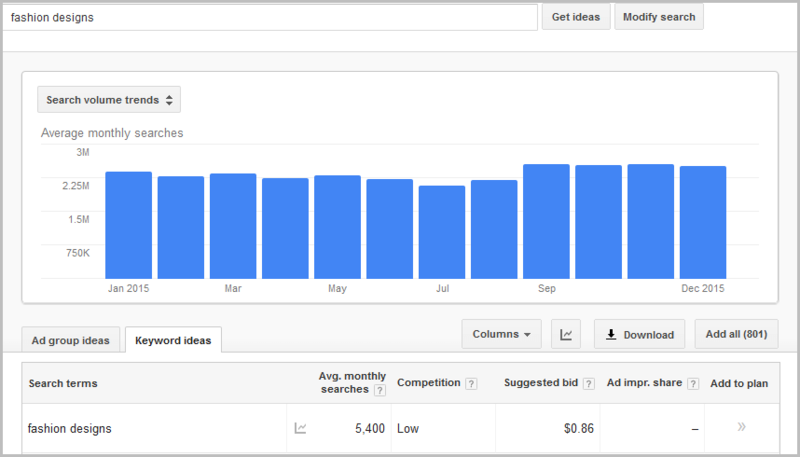 It attracts 5,400 average monthly searches and it has a low competition. Write a description that will tell people the kind of content they expect to find on your Pinterest Board. The description you write should be good enough to encourage Pinterest users to look at your pins. Have a call to action that is inviting people to join (follow) your Pinterest Board. Your description should include the keyword you used to name your Pinterest Board. Choose the category that is appropriate for the topic you’re blogging about. If you can’t find the most suitable Product Category for your Pinterest Board, you should then choose “Other” as the category. The rest i.e. Map, Secret and Collaborators are optional, but this doesn’t mean that they are not useful. In order for you to get more traffic to your blog using Pinterest, you should first do a little research to find out topics that are having an audience on Pinterest. Find out the topic that is receiving a lot of repins. The topic should be related to one of your blog post. Once you find a topic with an audience on Pinterest that suits your blog post, you should create an influential information infographic on that topic. You’ll have to edit your blog post so that you add the infographic you have created. When you’re done with the editing, you should pin it to your Pinterest blog. You can also create content having information related to the topics on Pinterest that have an audience. Some of your readers who are using Pinterest will pin your blog posts. Another way to get traffic to your blog is by sharing pictures with inspirational quotes related to the topics that get a lot of repins on Pinterest. The inspirational quotes you’ll pin should link back to your blog posts. In other words, you should pin your blog posts that will have an audience on Pinterest. One of the plugins that will add social media buttons on your blog posts is AddThis. 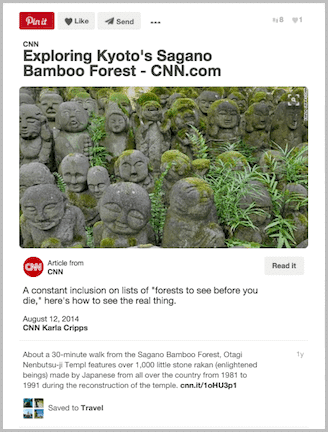 Article Pins are a recent addition to Pinterest, and they’re very similar to Rich Pin. Article Pins inform online readers that they’re clicking on a page which has original content that tells the story. 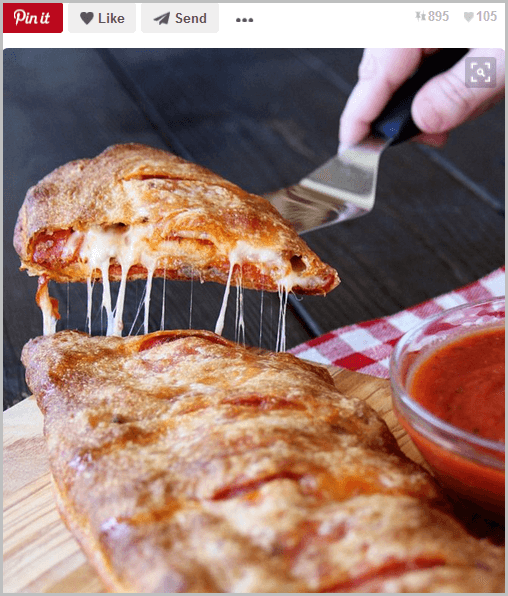 Here is an example of an Article Pin that was posted on Developers Pinterest website. Why should you use Article Pins and Rich Pins instead of the regular pins? A lot of people are reading Article Pins and Rich Pins. It is where a lot of traffic is on Pinterest. Article Pins allow you to share a lot more information than regular pins. When you pin a blog post using an Article Pin, it will automatically include important information such as a link to your blog, the headline, a summary and the author. If you want to get more traffic to your blog using Pinterest, Article Pins will greatly help you to accomplish that. Sites that regularly post articles are finding that Article Pins perform well. They can help you turn Pinterest into one of your top traffic referrers. To use Rich Pins, you’ll need to apply with Pinterest. This means that you need to make sure your blog meets Pinterest’s Rich Pin requirements. You can head to the Pinterest Developers Rich Pin website to learn more about Rich Pins. You want to grow your audience and also take your content to the right people it’s targeting. When you connect your Pinterest account with Twitter, you make it possible for you to grow your audience. Your content reaches many people. As your content reaches many people and your audience grows, traffic to your blog also increases. Since Pinterest is all about visual content, you need to make sure that you use eye-catching images in your blog posts so that they’re shareable on Pinterest. You should write descriptions for your images that will make people to find out more information about your pins. This is one of the ways on how to get more traffic to your blog that you should start using. Pinterest users won’t click on images that are of poor quality, so make sure you go with quality images that are eye-catching. This way, Pinterest users will click on your pin, visit your blog and hopefully repin it. Make sure your images are unique in order for them to stand out on Pinterest. With thousands of images being pinned daily on Pinterest, you need to use images that will attract the attention people so that they click on your pins. Images which don’t have faces receive 23% more repins compared to images with faces. Like this below image that doesn’t show face, it has received more than 800 repins with more than 100 likes. You can’t ignore this fact that was revealed by a study. It is for this reason that you should use images in your blog posts that don’t show faces. 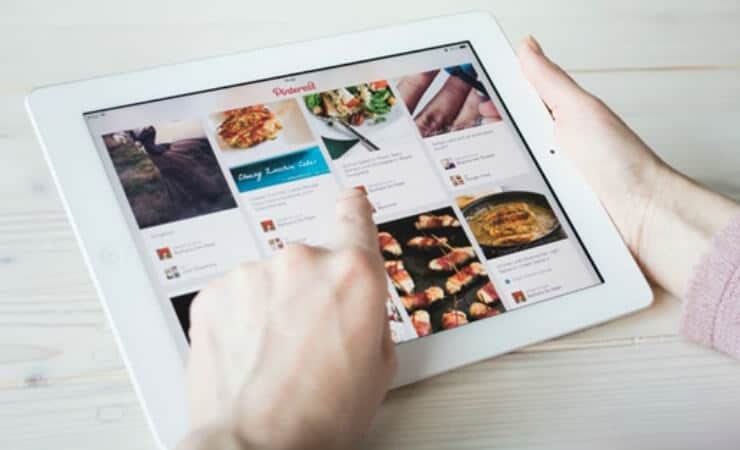 You already know that most people are using tablets and phones to access Pinterest. It is where most of Pinterest traffic comes from. This is the kind of traffic you should target on Pinterest. Make your Pinterest Board to be mobile-friendly. You should view how your Pinterest Board and pins look like on a smartphone so that you make the necessary adjustments if you find they are not mobile user-friendly. Your blog should also be mobile-friendly. This is how to get more traffic to your blog from Pinterest. When you pin your blog posts to Pinterest, make sure that you’ve written captivating and keyword optimized descriptions. Your pin descriptions will appear under your images. Descriptions offer users with information about your pins. Write your own pin descriptions since you’re the one who can describe your blog posts in the most appropriate way. Each time someone else pins your blog post from your blog, your description will appear, although it is possible for users to delete your description and write their own description. You can write the description like the way you write a blog post description. Make sure that you write a good description that will capture the attention of people on Pinterest. You want people to click through to your blog. When writing your pin descriptions, include relevant keywords so that people can find your pin when they search on Pinterest using relevant search terms. While it’s possible to use up to 500 characters in the description, it’s best to keep the description short while still including important information. This is one of the ways you should use to get more traffic to your blog using Pinterest. You want to get more traffic to your blog using Pinterest. Do you know that by tracking your traffic to your blog will enable you to drive more traffic to your blog? When you track your Pinterest traffic, you’ll know the pins that are driving a lot of traffic to your blog and the ones that don’t drive traffic. You can later on work on how you’ll improve your pins that are not getting any repins and click throughs to your blog. You’ll also write the kind of content to publish to your blog that will get shared on Pinterest by your readers. One of the mistakes that people make on Pinterest is that they don’t engage their followers in any meaningful conversation. When you engage your followers, you make them to find out more about you. Some of your followers will visit your blog because they know that they’ll benefit by reading the content on your blog. I.) Asking your Pinterest followers questions. II.) Answering questions asked by your Pinterest followers. III.) Commenting on pins posted by your followers. IV.) Addressing your Pinterest followers by their names. V.) Pinning interesting and useful content regularly. You should also follow popular boards on Pinterest that are discussing the topic you’re blogging. When you follow popular Boards, you are also gaining exposure.